To book online, click on the Reserve A Seat button below. Round trip transportation on deluxe highway motor coach. Fully escorted tour with tour director available 24/7. 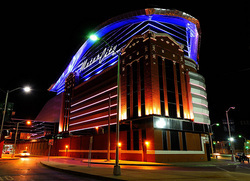 Overnight stay at the highly rated 5-star Motor City Casino Resort & Conference Centre. 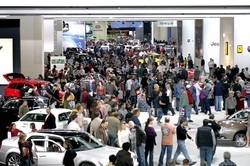 Admission to the North American International Auto Show, also known as Detroit Auto Show or NAIAS. If you have no interest in the auto show, you have the option of a trip to the upscale Somerset Collection Shopping Mall for 3 hours of shopping instead. Admission to the world famous Henry Ford Museum.... it's way more than cars! Two hour guided bus tour of Detroit with a local tour expert. $25 in free slot play at the casino. Deluxe hot buffet breakfast at the hotel on Sunday morning. We never charge a single supplement or surcharge! Travelling by yourself? We guarantee to find you a roommate (of the same gender) or we pay the surcharge for you! Of course if you wish to have a private room by yourself, it's not a problem, you can pay the Single occupancy rate. Other options are Triple occupancy (if three of you are travelling together and wish to share a room) and Quad occupancy (if four of you are travelling together and wish to share a room). One of the largest casino resorts in Michigan, Motor City Casino boasts 400 deluxe rooms, 2900 slot machines, 59 gaming tables and a 12 table poker room. Each deluxe room is equipped with complimentary WiFi, 300 thread count linens, marble bathrooms and in room coffee makers. If you're an auto buff then you're going to have a blast at this show. Imagine visiting one of the largest auto shows in North America and checking out the next generation of transportation with more than 500 vehicles on display, representing the most innovative designs in the world. That's pretty cool whether you're a fan of automobiles or not. For those who don't have any interest in the auto show, you will have the option of visiting the Somerset Collection, a luxury 1.4 million sq.ft. shopping mall. 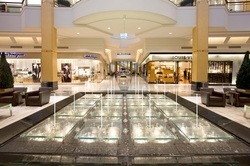 Somerset Collection has 180 high end stores including 4 department stores: Nordstrom, Meiman Marcus, Macy's & Saks Fifth Avenue. Some of the other brands include Gucci, Burberry, Louis Vuitton, Ralph Lauren, Ferragamo and Barneys of New York. For more information or to get a directory of the stores at the mall, click here. Henry Ford was an eclectic collector. The items that he collected, combined with those that have been aquired by his trust, are on display in what has to be one of the best kept secrets in America.... The Henry Ford Museum. Visitors are allowed to get up close and personal with almost all of the items on display, touch them, climb on lots of them and take all the pictures your camera will hold! This is such an interesting and amazing collection that there will be something here that will certainly capture your attention and make the whole trip worthwhile. 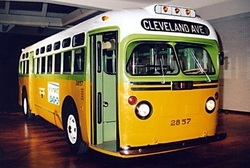 One of the items on display is the original City of Montgomery transit bus that Rosa Parks was on. You have all heard of the incident in 1955 when she refused to give up her seat to a white man. Well, not only has the Henry Ford Museum got the actual bus on display but you can get on the bus and have pictures taken of yourself inside the bus sitting on the seat that Rosa Parks sat on. How cool is that? Abraham Lincoln's Chair. President Abraham Lincoln was sitting in this rocking chair when he was assassinated. President John F. Kennedy's limousine from the tragic day when he was assassinated. See the limousine in which he rode with his wife Jackie. Of course, as expected the Henry Ford Museum probably has the world's best collection showing the history of the automobile. Some amazing cars that you will never see anywhere else from the original Model T Ford to the present day. Not just limited to cars, almost all other forms of transportation are here including some stunning steam locomotives, tandem bicycles, motorcycles, aircraft and even the original McDonald's Drive Up and the Oscar Mayer "Weinermobile"! Pickups are also available in Kitchener, Woodstock, London & Chatham upon request. We leave Toronto on Saturday morning at approximately 8:00AM. Actual pickup times vary by stop and will be sent out in the final email to all registered attendees, 2 days before the trip. Children are not allowed on this trip. All passengers must be 21 years of age or older. US Immigration requires that all travellers MUST have appropriate documentation to enter the USA. This includes a valid passport, a Nexus card or an Enhanced Drivers Licence known as an EDL. Please make sure that you have the appropriate permission and paperwork to travel to the USA. If you are denied entry into the USA, we will leave you at the border and pick you up on our return to Canada. No refunds will be given.